What is Melasma? How Can You Treat it? For more than five million Americans, melasma is a daily, lifelong struggle. The stubborn, brown patches of skin that are associated with melasma can be difficult to fade, and oftentimes impact a patient’s self-confidence. 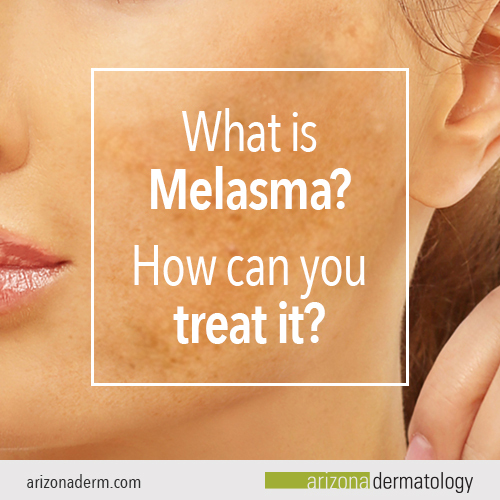 Melasma is one of the most common conditions we see at Arizona Dermatology. But, although melasma is a common condition, there’s a lot of misinformation about its causes, symptoms, and potential treatments. In this article, we’ll discuss what melasma is, what causes it, and what treatment options are available. Melasma is a chronic, noncontagious skin condition. The most visible symptom of melasma is the appearance of brown patches on the cheeks, forehead, upper lip, or chin. Although it can affect anyone, melasma usually occurs in women. While the exact cause of melasma is still unknown, it’s believed to be the result of the skins’ pigment cells, melanocytes, producing too much color. When melanocytes produce too much color, it’s general in reaction to a certain trigger. Sun exposure is one of the most common melasma triggers. Ultraviolet (UV) light and radiation from the sun stimulates melanocytes, which is why melasma often gets worse in the summer when patients are outside more often. Repeated sun exposure is also a key factor in the resurgence of melasma. Without taking steps to reduce sun exposure, patients with melasma often find it difficult to fade their dark spots. To protect yourself from the effects of sun exposure, we recommend wearing a sunscreen with at least SPF 15 every day. You should also avoid the sun during the hottest part of the day if possible, and wear accessories such as wide-brimmed hats to shield your skin from the sun. While protecting yourself from the sun will not cure melasma, it will keep your current dark patches from getting worse and prevent new ones from becoming visible. Birth control and hormone replacement medications are also common melasma triggers, due to the fact that the development of melasma is linked to the female hormones estrogen and progesterone. These hormones can over-stimulate melanocytes, resulting in dark patches. If you suspect that your melasma is due to your medication, talk to your doctor. They may be able to recommend an alternate prescription or treatment option. It’s possible to have a genetic pre-disposition to melasma, meaning that melasma can be inherited from your parents or other family members. This is particularly common in populations with darker skin tones, such as Hispanics and African Americans. Melasma occurs most often in people with darker skin tones because their pigment cells are more active than those of people with lighter skin. One study showed that 70% of patients diagnosed with melasma have a relative with melasma. If you have a darker skin tone and have a family member who has melasma, it’s likely you will develop melasma as well. Melasma that develops during pregnancy is known as chloasma. Sometimes referred to as “the mask of pregnancy,” chloasma develops due to a rise in estrogen levels that stimulate excess production of melanin. The discoloration caused by chloasma typically fades after the baby is born. If you’re suffering from cholasma, it’s important to remember that chemically-based treatments such as chemical peels and prescription medication cannot be used during pregnancy. How can you treat melasma? Melasma can fade on its own once a trigger is identified and addressed. 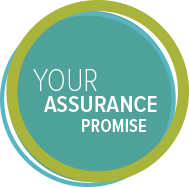 However, there are treatments available for instances where this is not the case. At Arizona Dermatology, we offer a range of melasma treatments. Depending on the severity of your case, a combination of treatments may be recommended. Intense Pulse Light therapy, or IPL, is a non-invasive procedure that uses pulses of light to treat pigmentation disorders such as melasma. At Arizona Dermatology, we use the Palomar Icon laser system to provide you with the most safe, effective, and state-of-the-art laser treatment. The laser emits pulses of light that reach the lower layers of the skin, breaking down melanin pigments and reducing discoloration. This treatment produces visible results with little to no downtime. However, due to the chronic nature of melasma, you may have to schedule recurring treatments to experience lasting results. Topical prescription medication may be recommended as treatment for your melasma. Depending on the severity of your symptoms and the sensitivity of your skin, we may prescribe a cream or ointment to use anywhere from one to three times a day. The medication should be applied directly to the affected areas. Hydroquinone: This medication works as a lightening agent. Hydroquinone reduces the activity level of pigment cells, which helps the dark patches of melasma to fade. Tretinoin: This naturally-occurring derivative of vitamin A (retinol) is used primarily to treat acne. However, it is also effective in exfoliating the skin. Tretinoin’s deep exfoliation helps refresh the skin and enhances the process of fading dark patches. Corticosteroid creams: These creams are used to reduce skin irritation that may result from other forms of treatment, as well as to help lighten dark patches. Because these medications can increase your skin’s photosensitivity, or sensitivity to the sun, it’s critical that you wear a sunscreen with at least SPF 15 every day during the course of your treatment. Chemical peels are an effective treatment for melasma because they eliminate skin discoloration and restore the look of an even skin tone. We offer chemical peels with light, medium, or heavy depth. Perfect Peel: This heavy peel works to repair and nourish the skin, resulting in a radiant glow. While this is our strongest chemical peel, it’s safe for all skin types. Patients typically experience minimal to no discomfort during the 30-minute treatment. Vitalize Peel: This peel has a quick recovery time and is gentle enough to be used every three weeks. It works to effectively reverse the signs of sun damage and discoloration. What are the side effects of melasma treatments? The most common side effects of the treatments we offer for melasma are sensitivity and irritation of the treated areas. You may also experience redness, itching, peeling, or burning. These symptoms should subside in the hours or days following treatment. If they don’t, you should talk with your dermatologist. Depending on your skin’s sensitivity level, a different treatment may be recommended. Whether you’re looking for treatment for your melasma or have questions about anything else related to your skin, we’re more than happy to help. Schedule an appointment today to meet with one of our friendly doctors.